Wedding dresses come in all shapes, colours and sizes, so every blushing bride feels unique. From Grecian gowns to rockabilly skater skirts, there’s something to suit everyone. But unless you’re willing to fork out for a bespoke one-off design, it’s likely someone else, somewhere, is also trying on the exact same dress as you. If you have a vision and love making your own clothes, why not make your own wedding dress? Imagine walking down the aisle wearing the ‘perfect’ dress you’ve made yourself. Our complete wedding dress material guide includes bridal lace fabric, satin, silk & more. Custom fabrics in our wedding dress material guide give you the opportunity to push boundaries when it comes to tradition. 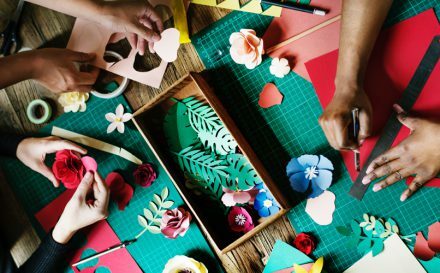 From materials for the actual body of the dress as well as fabrics for appliques, petticoats and overlays, you can design and make the dress of your dreams. This beautiful, almost weightless fabric, is made from 100% natural silk, boasting a glossy, lustrous face and elegant flowing drape. I think it’s perfect for the body of your gown as it’s comfortable to wear and durable. The way it moves over your skin effortlessly and falls in natural waves and folds makes it a favourite fabric for bridal wear. 100% silk has a gorgeous silvery base tone, and reflects the light very easily. The gentle colour reproduction is ideal if you’re after a subdued, elegant print on your dress. The name alone evokes imagery of a glamourous, lavish affair reminiscent of a fairytale wedding. It features a beautiful white knitted lace front bonded to a silvery, satin back, giving your dress a unique jacquard effect. Soft, with a slight stretch, you can easily create a dress shape that accentuates your silhouette without being overtly figure hugging. Delicate but durable, Princess lace will hold its shape well and has a fairly solid construct. Whilst the glossy, shimmery satin adds life and movement, the matte knitted lace brings a decorative, textured look, giving your dress a lot of character. I personally love the way you get a subtle sparkle from the satin peeping through from the back. Tip: To make beaded bridal lace fabric, sew your own pearly beads to the corset or waistband for extra decoration. This is what I’d call a quintessential bridal lace fabric. It has a distinct floral pattern in its construction, combining delicate webbing with solid flower motifs. Flora lace can be used for any element of your dress, but I particularly love it when it’s sewn into romantic sleeves. As its custom printed with your design, your traditional dress style will have a sprinkle of unique magic. 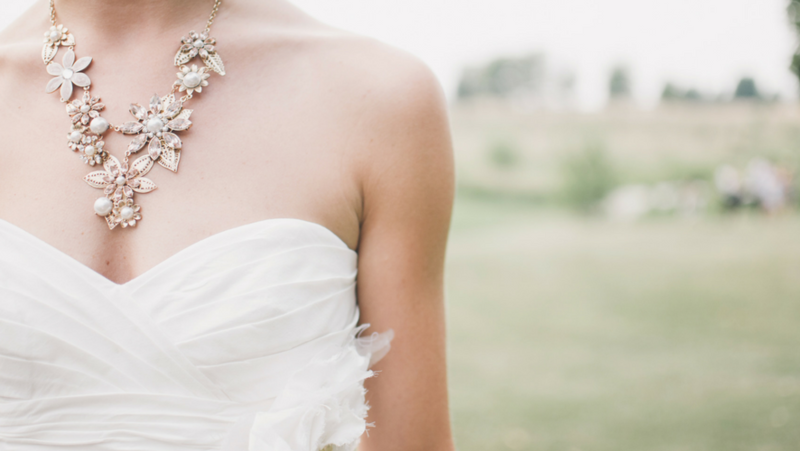 Part of your wedding ensemble might include added accessories, like a shawl, headpiece or veil. 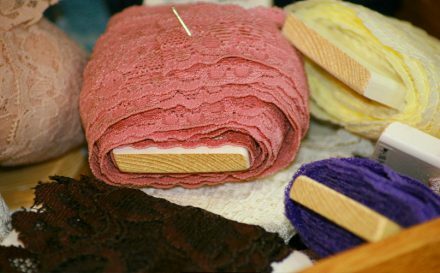 Whilst you could always go for more common fabrics, I’d suggest trying Lace Lucille. Despite the open net construct, it is naturally quite rigid and perfect for making appliques. Attach some customised bridal lace fabric to a hair slide and make a glamorous old school headpiece. 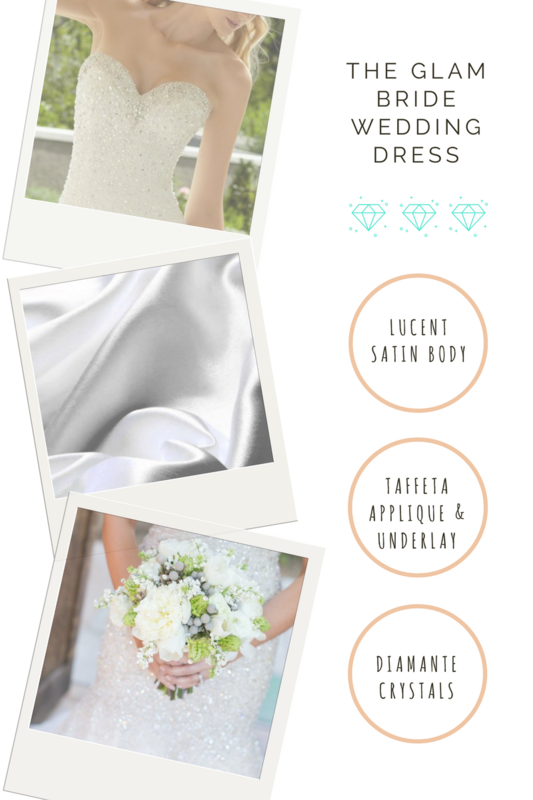 Although not a typical listing you’d see in a wedding dress material guide, I think cotton satin is a great choice for bridal wear. Made from 100% real cotton, this natural satin weave fabric has all the makings for a rustic, bohemian wedding outdoors. The cool, crisp touch, smoothness and drape all contribute towards the effortlessly fresh and classy aura of cotton satin. Simplistic dress patterns offer an understated but timeless style, ensuring the sentiment of the day remains the most important thing. With a daisy chain flower crown and a bouquet with muted tones, your cotton satin wedding dress is forever tasteful. I love the washed-out appearance of Vintage Fade. It lends itself well to creating a dress with an authentic, rustic charm. With its unique desaturated print, your wedding gown instantly transforms into a vintage dress from the past, full of character. The open plain weave construct allows for some much needed breathability, as it’s an overall taut fabric. If you’re looking for structure, the slight starchiness helps the Vintage Fade retain its shape, and it’s incredibly easy to work with. Soft floral patterns produce a distinguished dress that everyone will remember. For a show stopping high lustre wedding dress, you can’t go wrong with Lucent satin. As you’re walking down the aisle, the shimmery face dances in the light, creating movement without having to layer textures. 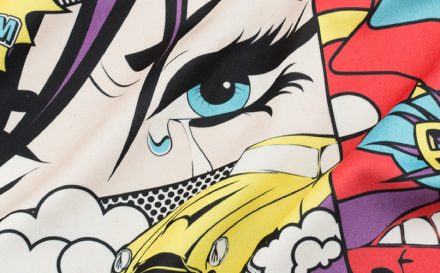 This satin produces a wonderful, intense print, as the colours contrast with the stark white base tone. Your dress will slip on easily and feel cool against the skin, allowing you to enjoy the day in total comfort. A favourite wedding dress material, our crisp, lustrous taffeta combines structure with style. Renowned for its rustle, this fabric falls in natural folds and is ideal for adding depth and texture to your dress. Gather it up to create classic ruffles, pleat it for a unique take on a bridal skirt or make stiff, bespoke appliques. Featuring a slight sheen to the face, you can twinkle and glow as you walk down the aisle in your taffeta wedding dress. 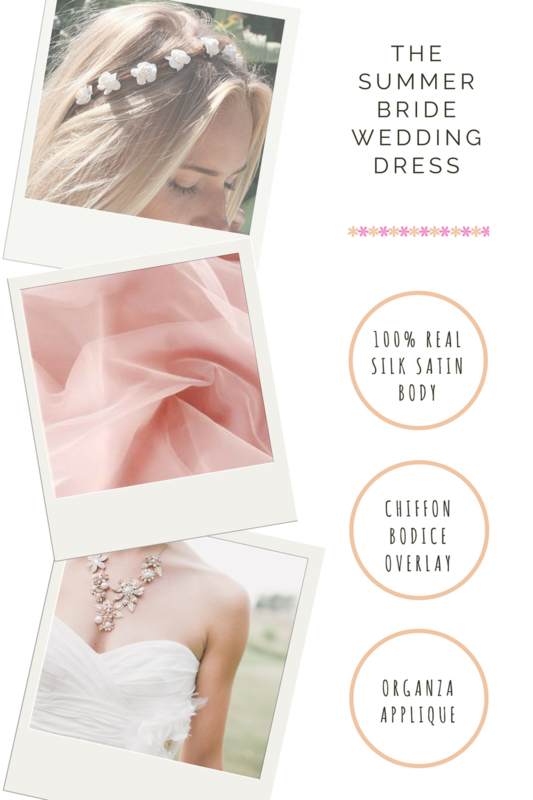 Any wedding dress material guide wouldn’t be complete without chiffon. Perfect for adding drama and femininity to your gown, our Paris chiffon is typically used for overlay. Add a wrap detail to the bodice using this fine, delicate fabric, or stitch into the ruffles for added texture. The muted print and transparency allow you to make a dress that has subtle design elements without being overly fancy. Bridal wear and organza are a match made in heaven. The glittery silk fibres combined with its sheer quality and subtle stiffness make this fabric a must for appliques, petticoats, embellishments and overlays. Printing on Organza creates an ethereal aesthetic, perfect for adding another dimension to your dress. Organza is a fine, delicate fabric that can also hold its shape well when manipulated, so it’s perfect for making cascading waterfall ruffles and beautiful veils. Print a graceful pattern onto Organza for a subtle but effective way of injecting personality to your gown. Up the theatrics with a marbled velvet bolero to wear for your winter wonderland wedding. 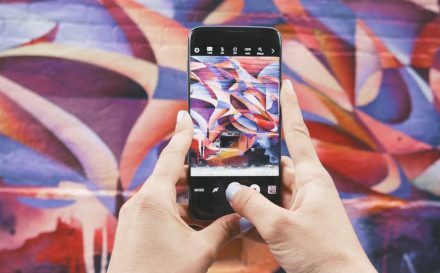 Your designs dance in the light, creating movement and drama. With the glistening short pile you get a stunning cape that captures the essence of twinkling snowflakes. In a country where summer weather can’t be predicted, tying the knot in winter has been gaining popularity. And why wouldn’t it when you can wear gorgeous accessories like a velvet bolero? 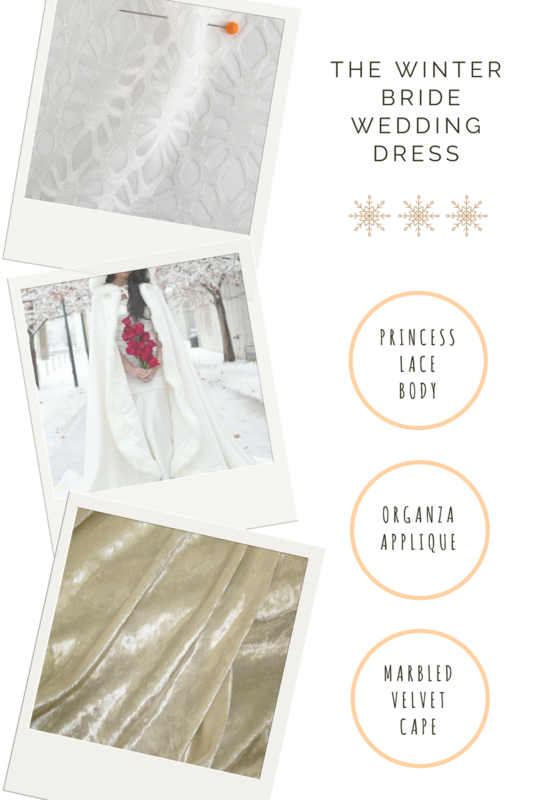 This wedding dress material guide has only just scratched the surface when it comes to bridal lace fabric, satin and silks. Feel the difference between different types of bridal fabrics and explore over hundred other materials with your very own fabric swatch pack. Understand the texture, strength and finish of the fabrics by taking a hands on approach.